The opening shot of First Reformed, Paul Schrader’s startling meditation about despair and a loss of faith, serves as a metaphor for the doubt growing inside Ethan Hawke’s Reverend Ernst Toller. In complete silence, the credits appear on a black screen. But then a subtle illusion begins to appear: a tiny yellow cross glows from the very center of the black screen, so faintly I thought I was imagining it. Slowly, the contrast brightens to illuminate a shot of a quaint white chapel, the sight of the small golden cross perched at the top coming into view. Drowning in darkness, with the slightest glimmer of hope just barely perceptible, is where Hawke’s tormented pastor resides. Anyone who encounters Toller wouldn’t have a clue about the dread gnawing at his insides, though. “I am happy,” he insists, failing to hide a whiff of annoyance when Esther (Victoria Hill), a colleague at a nearby church and former lover, prods about his well-being over lunch. The 46-year-old Toller is a reserved, yet approachable pastor at a small historic church in upstate New York. When a pregnant woman (Amanda Seyfried, doing her best in a forgettable role) grows concerned about her husband’s depression and violent inclinations, she calls on Toller to council him. It makes sense why she turns to Toller instead of the animated, CEO-like Pastor Jeffers (a great and magnetic Cedric the Entertainer) who leads the megachurch nearby; when we see Toller deliver sermons, give a tour of his cozy church, and engage in debates about mankind’s suffering, he appears to be as solid in his faith as any righteous clergyman. But perhaps that’s a projection of how those in need want to view a man of God. Internally, Toller is sick, physically, emotionally, and spiritually. We only learn this through his latest hobby: Writing in a daily journal, which Hawke reads aloud in voiceover. First Reformed, which Schrader wrote and directed, is in many ways his own Diary of a Country Priest, borrowing elements from Robert Bresson’s 1951 film about a clergyman castigated by local townsfolk. Like Bresson’s protagonist, Toller confesses his inner sorrow and most shameful thoughts in his diary. He’s also pained by some vague stomach malady, and in place of wine, Schrader’s priest lives off a strict diet of whiskey. There are also traces of Schrader’s most well-known character in Toller, Taxi Driver‘s Travis Bickle; both lost souls searching for a larger purpose. But the diary, like Toller’s alcoholism and perhaps his initial attraction to a religious profession, are merely avenues to help Toller cope with grief. We learn he lost his son to the Iraq War years ago after encouraging him to join the service as he once did. That death led to a crumbled marriage, and now Toller remains alone with his thoughts in his bare bedroom and in church, often preaching to a near-empty congregation. But when Seyfried’s Mary comes along, Toller soon finds a new purpose. Mary’s husband Michael (Phillip Ettinger) is an environmental extremist who can’t justify bringing his unborn child into a doomed world. Michael rattles off perturbing climate change statistics, warning Toller about the state of the earth in 30 years time with the conviction of a priest quoting the Bible. Michael and Toller wrestle over moralistic quandaries and existential enigmas – “It was exhilarating,” Toller later recounts in his diary – until, eventually, the radical ideas of Michael’s ecoterrorism begin to infect Toller’s belief system. “Can God forgive us for destroying his creation,” an anguished, bursting-from-the-seams Toller asks Pastor Jeffers (and us), no longer certain where to place his devotion. Hawke’s performance nails a fine balance of incredible restraint and release. He’s almost playing two separate roles – the inspiring pastor who preaches an It-Gets-Better sermon to those in pain and comfortably admits that not even he knows the mind of God, and the hopeless, terrified skeptic corroding him from the inside out. But then again, don’t each of us carry such contradictions of who we purport to be and the critical voice we keep locked within? Hawke does some of the best work of his career here. It’s a soul-rattling performance, and not in the way we usually think of booming and theatrical expressions of angst and unrest. He has a few big outbursts, but what’s most powerful is how he slowly and delicately brings the interiority of Toller’s agony to the surface. 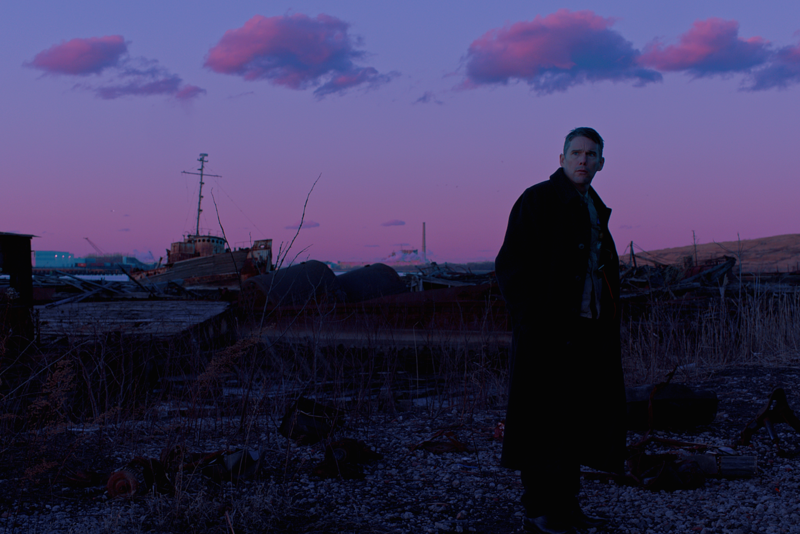 As much as Schrader’s film may sound like another tale of a sad white man, First Reformed is brimming with much more surprising turns and unsettling contradictions. What begins as a patient and unvarnished look inside one man’s depression escalates into a crazed psychic and spiritual unravelling, one with shards of grisly violence and ethereal visions – one gorgeous levitation moment is a nod to Andrei Tarkovsky’s Mirror. Save for a few bursts of vivid color, Schrader and cinematographer Alexander Dynan adopt an austere visual aesthetic, one made up of gloomy greys and stark whites and cold, wintry landscapes. Shooting in a tight 1.37:1 aspect ratio – similar to Pawel Pawlikowski’s excellent Ida, another inspiration for the film – Dynan boxes the actors in with claustrophobic, uncomfortable close-ups, opting for static shots and long sequences with minimal cuts. That visual style, along with hardly any musical score telling us how to react, forces us to watch closely and sit with the still, quiet moments and vacant spaces haunting Toller. 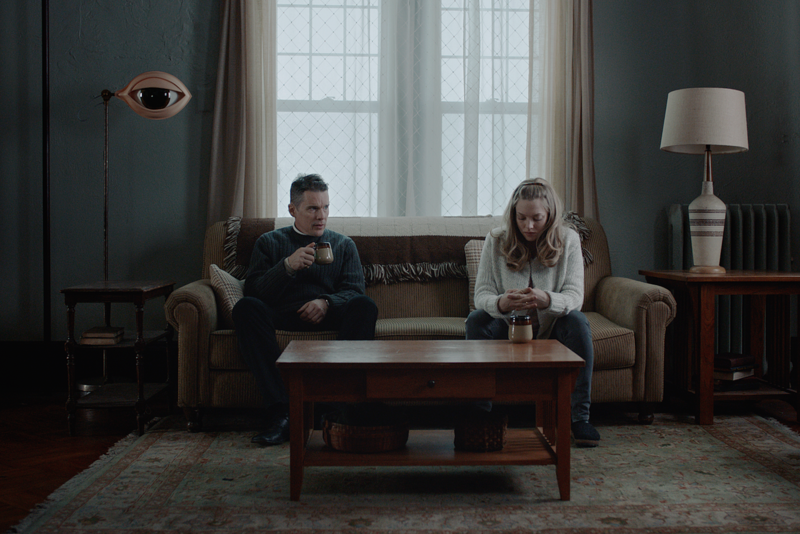 First Reformed is the type of film that leaves you with more profound questions than answers. You’ll probably need to see it two, maybe three times to really soak it up, but even after a single viewing, it left me completely awestruck. Schrader may ease us into his clergyman’s spiritual toiling with his unhurried opening shot, but he ends with a thrilling sequence that nearly pulled me from my seat, and will ensure this film lingers with me for some time.